Bring on style and elegance this season with Gloria! 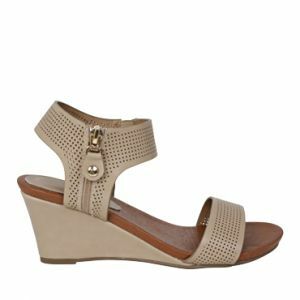 A chic wedge sandal with a leather-look finish, Gloria features two sturdy straps. No need to worry about zips or buckles— just slide on and go! Add elegance to any outfit with this versatile wedge. With chic metallic detailing, Gloria has a striking silhouette. Gloria is perfect for formal occasions, or to dress up an otherwise casual ensemble. For more footwear in a wedge style, we recommend Willow!